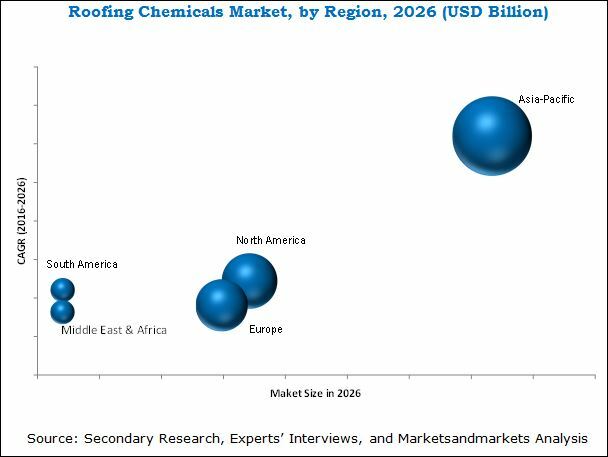 [172 Pages Report] The global roofing chemicals market is projected to be valued at USD 160.25 Billion by 2026, at a CAGR of 7.8% from 2016 to 2026. In this study, 2015 has been considered the base year and 2016 to 2026, the forecast period, to estimate the global market of roofing chemicals. The growing demand in the Asia-Pacific, South American, and Middle-Eastern & African regions, coupled with the growing demand for energy efficient buildings with the help of bio-based roofing chemicals, is expected to drive the global roofing chemicals market during the forecast period. This research study used extensive secondary sources, directories, and databases, such as Hoovers, Bloomberg BusinessWeek, and Factiva to identify and collect information useful for this technical, market-oriented, and commercial study of the global roofing chemicals market. The primary sources are mainly several industry experts from core and related industries and preferred suppliers, manufacturers, distributors, service providers, and organizations related to all segments of the industry’s supply chain. The bottom-up approach has been used to estimate the global market size of roofing chemicals on the basis of type, application, and region, in terms of value. The top-down approach has been implemented to validate the market size, in terms of value. With the data triangulation procedure, and validation of data through primary interviews, the exact values of the overall parent market and individual market sizes have been determined and confirmed in this study. The roofing chemical supply chain includes raw material manufacturers such as BASF SE (Germany), The Dow Chemical Company (U.S.) and Du Pont (U.S.) among others, roofing chemicals manufacturers such as Saint-Gobain S.A. (France), 3M Company (U.S), Akzo Nobel N.V (The Netherlands), Sika AG (Switzerland) among others. Further, the products manufactured by these companies are used by residential, commercial, and industrial buildings. This research report categorizes the global market for roofing chemicals based on type, application, and region and forecasts the revenue growth and provides an analysis of the trends in each of the submarkets. These segments are further described in detail with their subsegments in the report, with value forecasts till 2021. The global roofing chemicals market is projected to reach USD 160.25 Billion by 2026, at a CAGR of 7.8% from 2016 to 2026. Roofing chemicals are experiencing a high demand from the construction sector in the Asia-Pacific region. Expansions and new product development activities undertaken by different companies for more energy efficient solutions are the key factors driving the growth of the global roofing chemicals market. Roofing chemicals helps in maintaining lower temperatures in the interiors of buildings by reflecting the sunlight on roofs. This reduces the energy consumption required to cool buildings. New innovative roofing chemicals have low Volatile Organic Compound (VOC) emissions that comply with standards set by regulatory bodies in the European Union, such as Regulation, Evaluation, Authorization and the Restriction of Chemicals (REACH) and Restriction of Substances Directive (RoHS). The asphalt/bituminous roofing chemical is projected to be the leading type in the roofing chemicals market from 2016 to 2026. The bituminous roofing chemical is a sticky, black and highly viscous chemical used for coating and for making bituminous shingles. High tensile strength, competitive life cycle cost, and improved surface texture makes bituminous the leading type of roofing chemical among others. The asphalt/bituminous roofing chemical is mainly used in commercial and industrial buildings such as warehouses, factory sheds, which increases its demand in the market. The growth in the commercial sector during the forecast period is expected to drive the asphalt/bituminous market. The bituminous roofing application is the largest application of roofing chemicals globally. Bituminous roofs are more durable compared to other types of roofing and are hence preferred. The demand for the bituminous roofing application from the Asia-Pacific region is expected to grow at a high rate during the forecast period. This is due to the increasing industrialization, and the growing manufacturing sector. The Asia-Pacific region was the fastest-growing market for roofing chemicals, in terms of value, in 2015 and this trend is expected to continue till 2026. China, India, South Korea, and Japan are the major consumers in the Asia-Pacific region. The demand for roofing chemicals is primarily driven by the increasing population & urbanization in these countries. The increase in population and urbanization creates a higher demand for buildings, and as a result drives the roofing chemicals market. India is a major growing economy in the world, and the demand for roofing chemicals is expected to increase during the forecast period. Though the global roofing chemicals market is growing at a fast pace, a few factors are hampering the growth of this market. The higher installation cost is a major restraint in the growth of the global roofing chemicals market. Companies such as The Dow Chemical Company (U.S.), Sika AG (Switzerland), Johns Manville (U.S.), GAF Materials Corporation (U.S.), and Akzo Nobel N.V (Netherlands) are the leading market participants in the global roofing chemicals market. These companies have been adopting various organic and inorganic growth strategies such as expansions, mergers & acquisitions, and new product developments to expand their market shares of roofing chemicals.